Thanks to all who helped make the reunion the success it was! The best part was the number of attendees! 2,567 people visited the school and fairgrounds on Saturday. There isn’t an official count for Friday night, but Sgt. Peppers was so packed, many overflowed to Shoeless Joes. Check out the news articles from our reunion weekend. Here are some photos from the reunion. Please contribute by sending your photos via e-mail to . We will post them in this Photo Gallery. These pins are a commemorative 50th Anniversary of MDHS at it’s Church Street location. Crafted by Barthau’s Jewelers of Stouffville to be a valued collector’s item. They are richly detailed in blue, white and gold with the MDHS crest and the date. Quantities are limited. We are selling the remainder by mail only. Please provide your return address. Pins will be shipped by Canada Post. The cost for the pin is $5 CDN plus $1.50 for shipping within Canada. We are using our archived yearbooks to make photocopied reproductions for people who have lost or never had their yearbooks. The cost of $35.00 per yearbook covers our printing costs and mailing. Turn around time is about six weeks. Your yearbook(s) will be delivered by Canada Post. 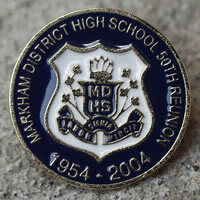 In 2004, Markham District High School (MDHS) will have been at its present location for 50 years, but more importantly it will have been educating Markhamites for 145 years. We're going to celebrate that fact in a big way, and we want YOU to be a part of the fun! Join us May 14 - 16, 2004 for an MDHS reunion weekend packed with special events, entertainment, and time to reconnect with classmates and staff. If you attended MDHS, taught or worked there in any capacity, this weekend is one you won't want to miss. This Website is designed to keep you up-to-date with all that is planned for you. Keep checking it! New information is continuously being added. Soon you'll be able to get all the current plans and registration information, leave a message for your graduating year, read about Markham District High School history, view the school as it appears today, add you name to the E-mail Directory - all this and more, right here! Please feel free to contact Bonnie at if you require additional information. Hello to all the Before 54 Alumnae! 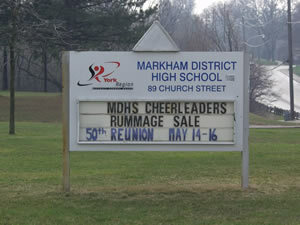 You are invited to drag out your old high school mementoes and plan a trip back to Markham for the 2004 celebration of 50 Years on Church Street and 145 Years Educating Markham. To find out how to become a member, visit the forum instruction page. If you are already a member of the forum, click the forum logo below to launch it into a new window.